The Planted Tank Forum > Specific Aspects of a Planted Tank > Fish > First Time Breeding Angels - 8 Weeks! First Time Breeding Angels - 8 Weeks! I procured a proven breeding female angel a few weeks ago that I added to my five bachelors in my main tank last night. Well after a lot of lip locking and bickering, my large silver has already paired with her. Her breeding tube is fully extended, they’ve taken over the entire tank. All 120 gallons. While I am doubtful they will spawn successfully, despite her good track record (spawned two days after arriving at the LFS), I would really like to take a shot at this for fun and to learn too. 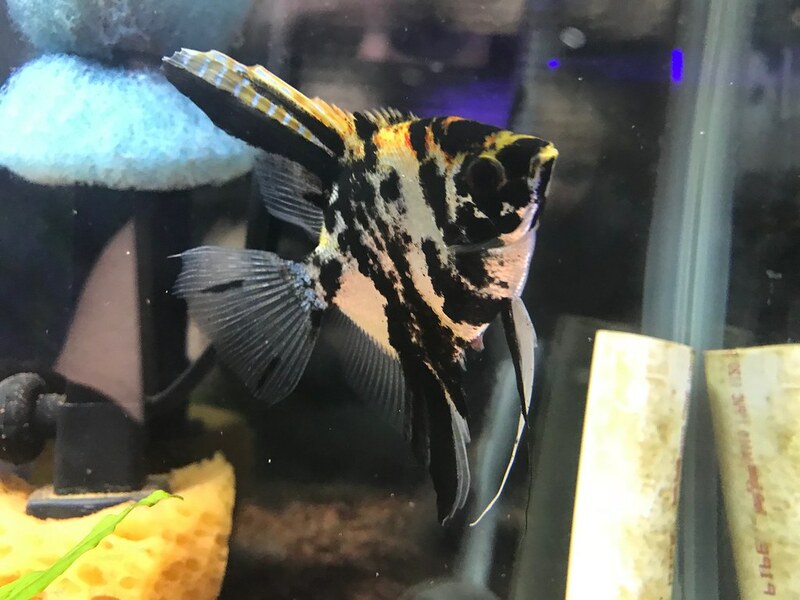 The LFS and their sister stores are also deeply interested in buying spawns since a lot of the local breeders of angels have stopped breeding. I have a few tanks I can utilize and I am picking up some sponge filters too since I only have HOBs. What is the best setup to go with, both in regards to spawning tanks and grow out tanks? The LFS where I got her from - the guy who helped me told me once the female starts cleaning off a surface in the DT to transfer them to a separate tank a 20 high is enough. He gave me a lot of other good information as well, but I am wondering more about setting up the tanks. I have a 20 high I use as a QT tank that I can easily set up for this purpose since the DT tank is now stocked. Is there anything I should add to the tank? I have pieces of slate, lava rock, petrified wood, etc. Or do I leave it empty? Bare bottom? Should this tank be switched to a sponge filter? For grow outs (I have one of her fry from the store in this tank actually) would a 10 gallon suffice? I have this tank sitting in a window to grow algae, it is bare bottom with a handful of plant trimmings since I’ve been feeding this guy very heavily with daily WCs and appreciate the ease of a BB tank for this. I plan on switching the HOB to a sponge filter. Breeding and grow-out tanks are better bare-bottomed- easier to keep environment clean. Angel juveniles are like discus in that they need several protein feedings daily and this requires frequent water changes to keep tank clean. For the Angels, you could add a breeding cone so that you have the ease of moving the spawn if needed. Sometimes they can spawn on surfaces that are not very practical- like the heater. For both, all you need is a sponge-filter for biological filtration because you are doing frequent water changes. With this, you are the mechanical filtration. Well the LFS store only had one sponge filter. I took filter floss and wrapped it around the intake tube of the HOB on the twenty, and I am getting ready to set up the 10 gallon, which is where I'll stick the sponge filter for now. I will keep with the bare bottoms for sure! My little one is getting ~85%-90% daily since she struggles to find food in the tank and leaves a mess! What size tank would you suggest for a grow out? I’m sure I won’t be successful right off the bat but eventually I am hoping to be able to get a good chunk of fry to survive. I am assuming my LFS stores would prefer they be nickel size and a 20 gallon is far too small for nickel sized angels (Well a large amount). I don’t trust my 40 long to hold water anymore but the stand is conveniently the right size for a 55. I don’t plan on going out and buying a tank right now until I can be successful just getting good spawns but I want to do research so I know what to do without too much failure along the way. The size of the tank for grow-outs depends on how much fry you have. For the normal size group of fry the 20 gallon would be too small. The 40 gallon would be perfect, but the 55 gallon will work just fine. I would say for an initial growout you could make 20 gallon work, but you'll definitely want to move them to the 55 gallon, and honestly it might be easier to start there given how much feeding and cleaning you'll have. You'll have to make sure your airpump has an extra hole for it. IMO if you're planning to grow out angels until Nickel size to sell to an LFS, you should make the investment in a 55. Do you know how large previous batches have been with your proven female. New pairs tend to have smaller batches so a 20H might work for the first batch or two. For the pair a 20H is OK but a 29 is better. Bare bottom with only a heater (horizontal), a filter, a breeding slate, and maybe some narrow leafed plants in pots, Vals or similar. For babies there are two choices. 1. Let them raise the babies by themselves. 2. Pull the eggs and raise them yourself. Angels Plus has breeding slates and Gallon jars. Get the 10 gal. setup and cycled. When they spawn on the slate, put it in a jar and into the 10 gal. to maintain temp. When they hatch siphon them into either a hatching jar or into a 2-1/2 gallon tank. When they start swimming (day 8 or 9) feed them newly hatched baby brine shrimp twice a day and do daily water changes. When they start to crowd the 2-1/2, move them to the 10. When they start to crowd the 10, move them to a 55. Depending on the size of the spawns, you might need 2 55s. They will spawn every 10 - 14 days so when the fry move to a bigger tank there will be the next batch waiting to go in. All tanks bare bottom with sponges in all but the 55s. I am not afraid of work. I can lay down right next to it and go to sleep. I was going to suggest a 29g breeding tank and a 55g growout. Another thing you can do is make an acrylic barrier for the 55g tank, in which case you might not need the 29g. The parents will have the entire tank for breeding and you can set up a partition to separate them, if neccessary. When I raised my keyhole cichild fry, the parents did not eat a single one. They did an initial cull of some eggs, but afaict, all of the wigglers (33) made it to healthy jueveniles. The trick is (obviously) to feed BBS 5x/day. But early on I noticed some of the babies eating from the parents pectoral fins; it was clear that the pectoral fins of the parents were chewed on the ends. Also, having a heavily planted tank, the parents would fan mulm from the bottom towards the swarm of babies to help feed them. The trick to having the parents raise the fry, what finally worked was turning out lights early and spending little time in the room. Let them do their thing, don't keep watching, don't threaten them in any way. Little Soprano, DonnaK, LittleSquishy and 1 others like this. I can do a 55 gal. I really appreciate all of this advice! I really am intrigued to start breeding these beautiful fish. I have a 40g long a buddy offered to reseal and replace the rim on, but the tank is 30+ years old, might be time to upgrade eh? The 20g High I set up has a little bit of flourite in it (one of the small bags), some java ferns, a massive wad of java moss from my DT, and a few flat stones scattered about the tank. All of my LFS and big box stores seem to be out of sponge filters. The 10g has a small angel growing out in it with a sponge filter, but for now I put a sponge on the intake of the HOB thats on the 20, along with filter pad zip tied to the intake holes further up the tube. Hopefully that will suffice? I was hoping to transfer today, but the cheapo Hydor heater I bought decided to raise the tank to 86 and keep it there. I found a finnex titanium heater that can actually be placed horizontally, just waiting for the tank to cool down. I stuffed the HOB with old filter pads from my DT sump, so it should be pretty much cycled. I am going to let them try a few times to raise them by themselves to see if they can do it. I’m sure they will probably eat them the first few times but the room is quite quiet where they are going. Only disruptions are me feeding my little angel a few times a day, her water change and feeding the SW tank across the way. It doesn’t get any other foot traffic really. Once a pair has "paired off," can you switch males around? I have a marbled male that would make for some beautiful fry with her. Last edited by Little Soprano; 12-28-2018 at 01:42 PM. They’ve finally been moved! They seem very comfortable but I may have to figure something out to block the view between their tank and the 10g. My little one has been going nuts at the glass checking them out and they’ve been doing similar. Not what I was expecting. Hopefully I get lucky soon! I used to use roof slate for my angels. I am fortunate to live where they mined the slate for roofs so the area is filthy with the stuff. I would let the parents raise them until they're about dime size, then move them. They need a lot of food for the first 6-8 weeks which means quite a few water changes. Get your biological filtration in order before you start breeding them and be able to start hatching brine shrimp. I used to raise them in 20 long tanks, but I would only put 30-50 in each tank depending on the size of the hatch. I have a handful of flat spots in there for them atm. There's a piece of PVC from my sump (I use them for easy cycling in QT/HT - they sterilize really easily between uses) that she's been taking an interest too. Will probably be better when I am at work and not in the room a lot. Almost wish I had another place to set the tank, I've been doing 90% once a day, and two 20% on my 10g, and I know it's interrupting them. She's a challenging girl though. Only fish I've ever had that refuses flakes or pellets. Even tried not feeding for 3 days, didn't work. She will literally only eat live baby brine, and frozen stuff - mysis, brine, cyclops. Between her and my little one being grown out, my hatchery has been running non stop. My LFS is waiting on new sponge filters to come in, so atm my fingers are tied. I could always put a HOB on the baby's grow out and move her sponge filter to their tank. She's almost quarter sized. Went to feed them this morning and saw this! After she ate, she went back to making practice runs. I'm hoping by tomorrow morning I have eggs! His breeding tube is out too but he just ended up starring at me the whole time I was there (this angel is like a puppy.). Room is off limits until tomorrow to ensure she's comfortable. If/when she lays what should I be doing for W.C? I’ve been doing daily’s on this tank. It does appear to have cycled now - diatoms galore and I’m getting nitrates finally (I stuffed the HOB with filter pads from my sump) but I worry with small tanks. Greggz, Thelongsnail and sakura83 like this. I spoke too soon. Had to grab something from the fish room and there are eggs! I ended up standing back and watching. Of all things she picked, it was an unused plastic grout spreader. There’s eggs galore. On the side of the tank too. Fascinating to watch. And my male is following right behind her. Still going too when I left. Super excited though we will see how they do. Greggz, Thelongsnail, Discusluv and 2 others like this.